Convertible car hire Firgas Gran Canaria. We compare prices from Gran Canaria’s leading rental companies. Our philosophy is simple, the best quality at the lowest price on your car rental. Our prices on car hire always includes unlimited mileage, and all necessary taxes and insurances. 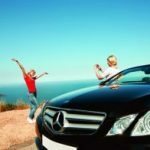 Use the search engine below for guaranteed best price on convertible car rental Firgas Gran Canaria in Spain. 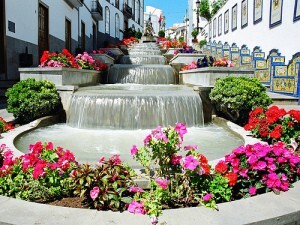 Firgas, a small town famous for its production of sparkling mineral water, which is tapped from a source in Barranco de las Madres, around 4 km away. With a production of over 200,000 bottles a day, this tasty water is very popular throughout the archipelago. 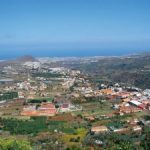 This pleasant little town, which celebrated 500 years jubilee her in 1988, also contains Paseos de Canaria and de Gran Canaria, where a manmade waterfall runs 30 yards down shallow steps in the middle of crosswalks that were added in 1995. On the back of the benches at wall of the adjoining house look beautiful, painted landscapes and historic symbols of the seven Canary Islands. Follow this fun-filled promenade to reach Firgas‘ Casa de la Cultura and an adjoining space that contains both the town hall and Iglesia San Roque where young and old meet at all times of the day. 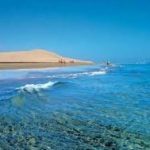 If you need car hire in Firgas, its easiest to order the rental car online and pick it up when land at Gran Canaria Airport. Then you easily can return the car when traveling back to your home country, and you do not need alternative transportation to and from airport. In most cases, this is less expensive than using small local car rental supplier in Firgas. Use the search engine above for guaranteed best price on car rental in Firgas. 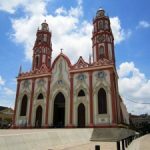 This entry was posted in Car hire Firgas, Car hire Gran Canaria, Firgas and tagged Car hire, convertible, firgas, gran canaria, rental car, Spain on 2nd February 2018 by Vera.